Has been an exciting couple weeks as I play with some old materials in new directions. I picked up a painting I’d started almost a year ago, a grid of blue squares that reminded my of the night sky and that expansive feeling you get when you chance upon the twilight colors, just before it really gets dark. Every time I looked at it, it made me want to breathe deep, but I had no idea what to do next so that someone else might get that feeling too. For whatever reason, last week I was inspired to pick up a brush, dust off my acrylics and dive into that piece again. 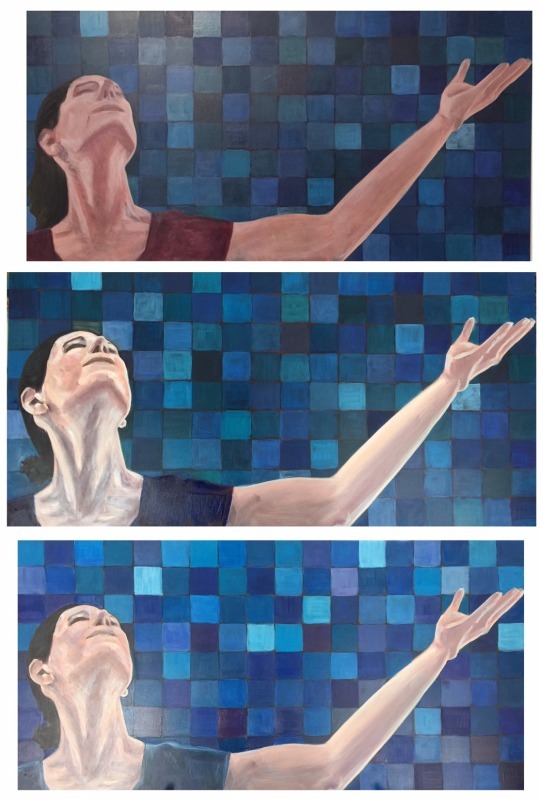 My hope is that adding the person doesn’t make it too heavy-handed/directive for the viewer and that just adding the simple figure while still leaving so much open background will maintain that sense of expansiveness… There’s work to be done, for sure, but I still feel excited about the progress.